In Dallas, I found myself visiting the Museum of Natural History, which is located on the Texas State Fairgrounds, with my youngest daughter T.C. and her oldest daughter Heidi, and my oldest grandson David and his then-girlfriend. I know this because there is a photo of them in my journal in front of the museum. 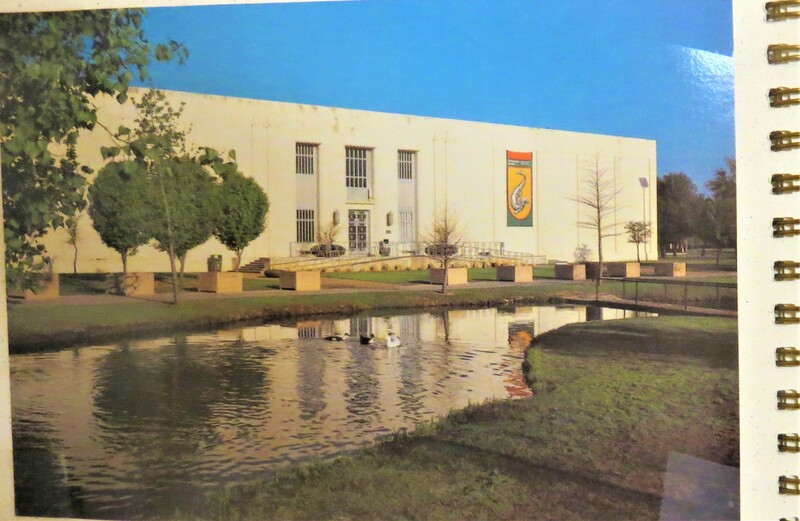 A postcard of the Dallas Museum of History from my 2002 journal. Sadly, the museum is now closed. I also took some photos of the museum’s bird dioramas because this trip was as much about seeing birds as it was spending time with family. And I noted in my journal, that this morning of June 25 began with me adding a blue jay to my life list. The blue jay is common in Texas, and I saw many growing up, but not a bird normally found in Northern Utah where I had done the majority of my birding after joining the ranks of birdwatchers in 1999. I’m sure I had a delightful visit with family in Dallas, but I didn’t write anything more about it other than the birds I saw and a bit about the museum outing. While I write in my journal almost daily these days, in earlier years there are big holes in my recorded thoughts. 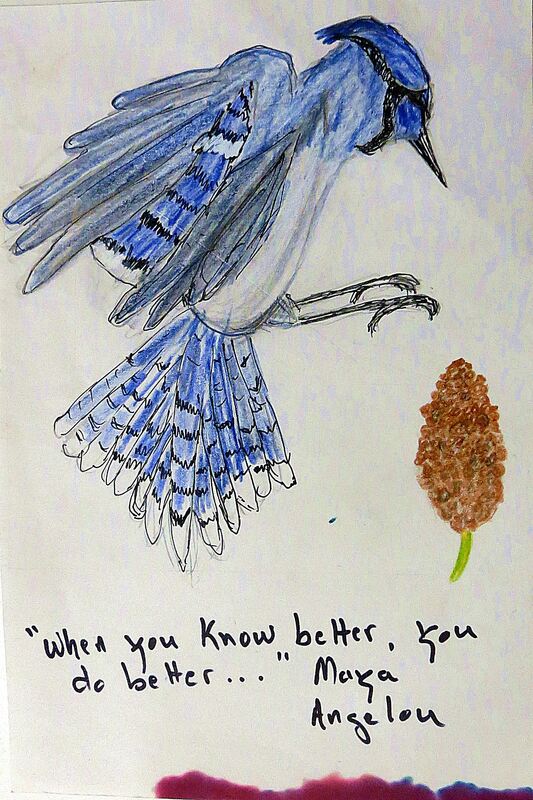 A quick blue jay drawing by me from my journal. I wrote quite a bit in the 2002 trip journal, however, about my visit to Lake Jackson to see my son, Lewis and his family – perhaps because it included a landmark moment that turned my son into as addicted a birdwatcher as his mom. It was a dreary morning, with rain threatening, but Lewis said: “Come on. I want to see what this bird-watching hullabaloo, or something to that effect, is all about. The two of us then drove to the Brazoria National Wildlife Refuge that was less than 15 minutes away. The first bird we saw on this overcast day, just as we entered the refuge grounds, was a red male (females are yellow) summer tanager, a showy bird that was impressive enough to interest even a non-birder like Lewis. It was while I was oohing and aaahing over a yellow-crowned night heron that Lewis asked me what the large bird sitting near the pond was. I glanced over and saw that it was a double-crested cormorant, a bird that I had seen many times – or so I thought. “What!” I turned my binoculars from the heron to the cormorant and realized he was right. This is the moment Lewis claims as addicting him to birding. I’m so glad for that moment, and not just because the neotropic was another life bird for my list. Lewis and I will get to go bird-watching together once again during my upcoming trip to Texas. We probably won’t see 100 bird species as we identified on a past April marathon day of birding, but we’ll surely make good memories that I can record in my journal. Bean Pat: Retronaut https://considerable.com/the-gargoyles-of-notre-dame-witnesses-to-so-much/ The gargoyles of Notre Dame Cathedral. Love your quick drawing. Such a beautiful way to capture memories. Si far, we’ve only driven by that refuge, but it is still on our bucket list for an extensive visit. 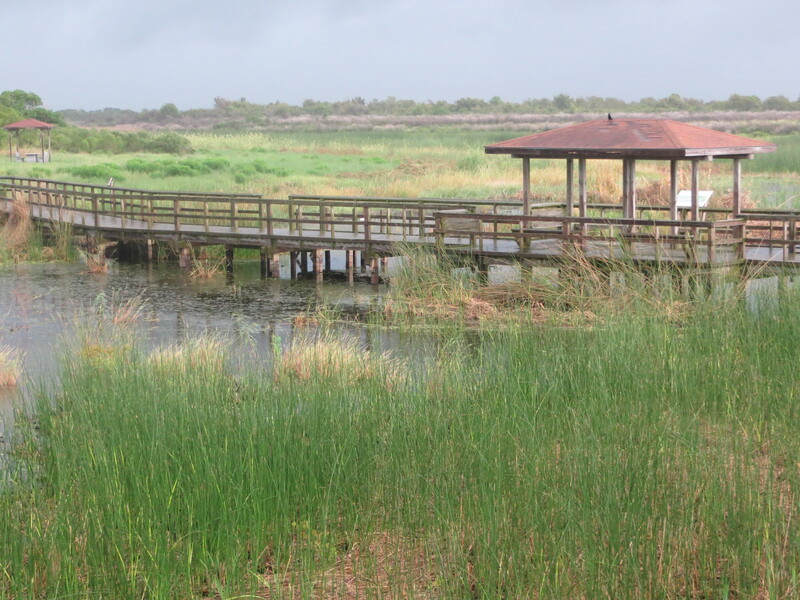 And don’t miss the nearby San Bernard National Wildlife Refuge. Thanks for commenting Pit, and happy travels. I fly to Texas tomorrow and will likely visit both refuges at some point in the trip. Thanks for the advice, Pat. Much appreciated. Safe travels, and should you ever be in the vicinity of or in Fredericksburg, just give me a shout.